It seems to be that today, as parents, we spend a great deal of time worrying about what we are feeding our children (is it local, organic, fair trade? ); what toys they are playing with; what books they are reading; whether they are getting enough sunshine – whether they are getting too much sunshine; whether there are parabens in their shampoo… the list is endless – and exhausting! One thing that we often forget to think about is the quality of the water that we are drinking, cooking and bathing with! Living in a developed country, we take it for granted that the water coming out of our taps is considered safe – at least to cook, brush our teeth or wash produce with. We also have access to and the means to buy bottled water. However, buying bottled water raises some questions such as: how are the plastic bottles stored and transported? Are they leaching chemicals in to the water? And at what cost to our health, budget and the environment? Our natural water resources are under ever growing demands, especially in a country like Cyprus, and the government has been making great headway in tackling the water shortage problems over recent years – recycled water for agricultural use; desalination plants and efforts to curb water overuse to compensate for lack of rain during the summer. However, chemicals such as chlorine, which are used in the water disinfection process, are present in our drinking water along with other contaminants such as heavy metals; pesticides; bacteria; inorganic and organic compounds (that may grow in your home’s pipes due to them being old or irregularly maintained/disinfected). Rainwater flushes airborne pollution (through industry, traffic congestion and dust storms) from the skies, before being washed over the land (that may contain chemical contamination from industry and agricultural pesticides) into our rivers and dams that then become our drinking water. The good news is that the drinking water in Cyprus is considered to be of good quality and the water boards in each city continually monitor the safety of our drinking water. Still, the question is: while our drinking water is generally ‘safe’… how ‘pure’ is it and are we sure that it is actually optimal for better health? So, what is in our tap water? 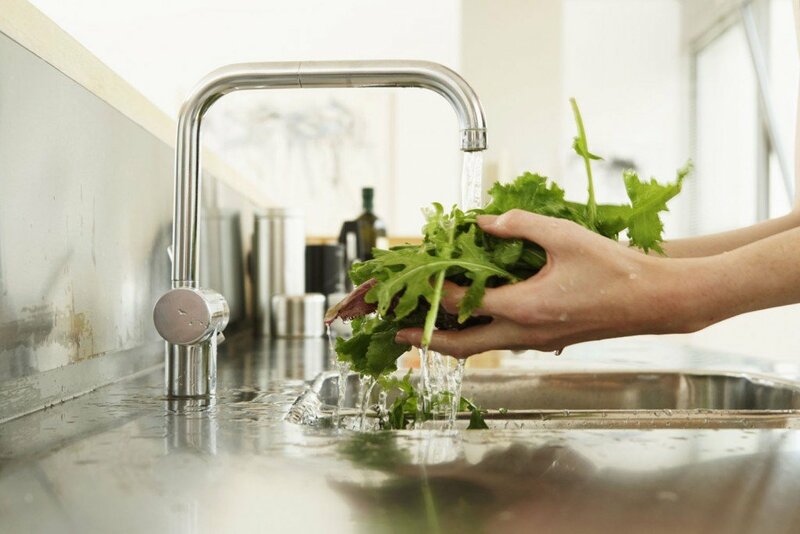 Chlorine – chlorine is added to water to make sure it is safe because its toxicity kills bacteria and other microbes that would otherwise make us ill. Chlorine is therefore essential to prevent the spread of water-borne diseases and is a necessary component of the water purification process. However, this doesn’t mean that we want to be drinking it! High levels of chlorine consumption have been linked to cancer and other morbidities. It is therefore advisable to remove chlorine from our water before we drink it. Lead – old, broken and corroded pipes (anyone who lives in the old town of any city may be particularly at risk of this) mean that drinking water could contain lead. Nitrate – particularly common in the drinking water in rural areas worldwide, it is a natural by-product found in water and also as a waste product from agriculture and industry. High levels of nitrate are particularly unsafe for pregnant women and children. Water-borne viruses such as e-coli, salmonella, hepatitis A, norovirus and rotavirus can all be transmitted through water, particularly from groundwater sources and wells. These viruses can also be present in the pipes, creating a ‘biofilm’ that can be transferred in to the drinking water. Should unsafe levels be detected when tested by local authorities, more chemicals such as chlorine are needed to clean the water. But it’s not all bad news, because we can actually take steps ourselves to improve our drinking water. 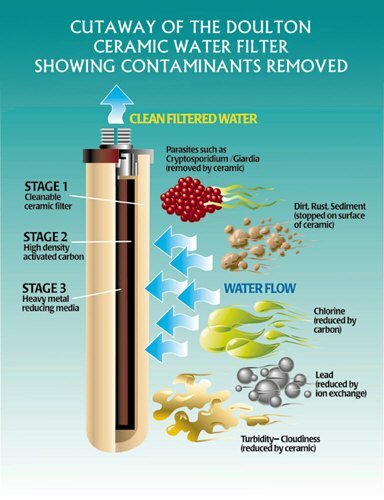 Water filtration systems can provide clean and healthy tap water by filtering out all of the harmful contaminants mentioned above, as well as improving the taste of our water and removing the odours that come from chemicals such as chlorine. Eliminate the use of plastic, which protects the environment and our health. In Cyprus, we get through an enormous amount of bottled water and only a small amount of this plastic ends up being recycled. There are also concerns about the way that plastic water bottles are transported and stored before being sold – with the potential for harmful chemicals being leached in to the water we are buying. Save money. Contrary to what we all think, buying a year of bottled water for an average family is much higher than the cost of installing a home water filter (including the cost of replacement water filters). Protect in the event of a water contamination crisis. Burst sewer lines or pipes can introduce viruses and bacteria in to the water system. Improve our skin and hair. The water in Cyprus is quite hard and contains a lot of lime scale. 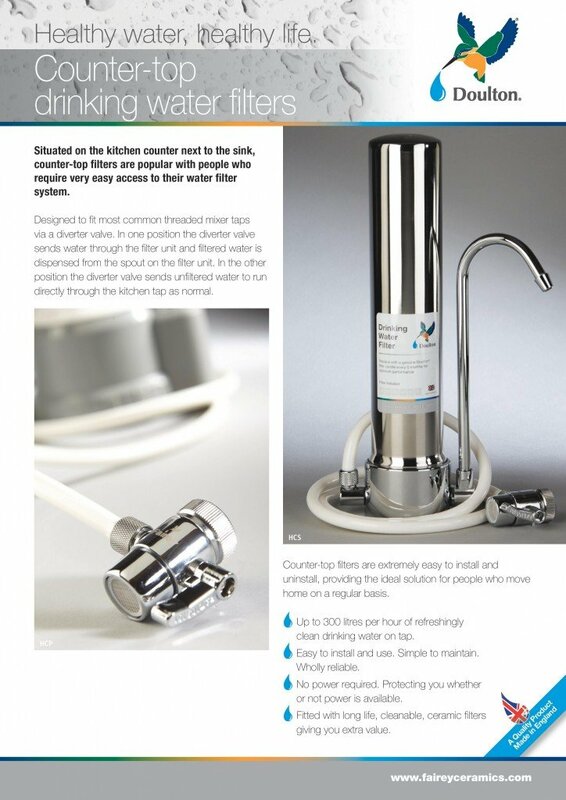 Filtered water is softer: better for skin, hair and electrical appliances. This also means purchasing less soap and cleaning products – saving us even more money and making our household more environmentally friendly. Ensure we never run out of safe water! 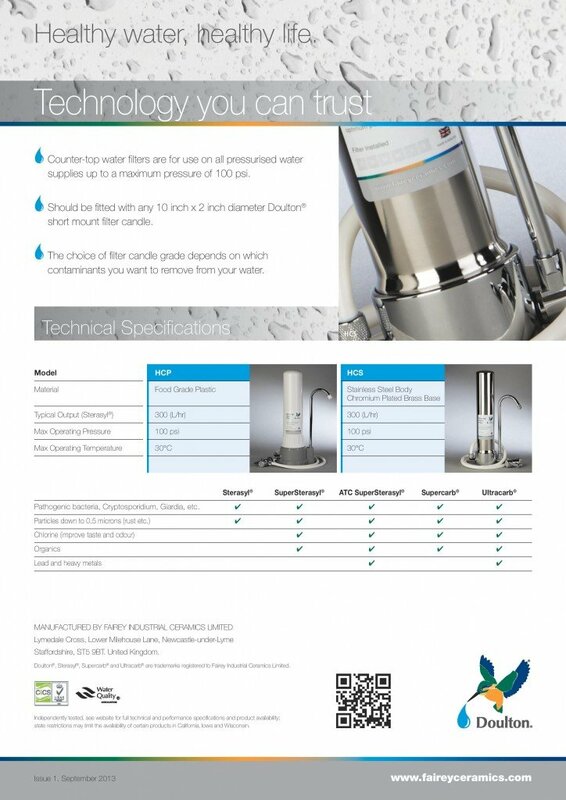 What is the best type of water filtration system? There are many different types of home water filtration systems from a filter installed at the water source, to under the sink and counter-top filters and water dispensers. There is no best product as such, and a choice should always be made on the needs of your family and budget. Great advice can be given by an experienced vendor, who can help in the decision making. Expert advice (gained from years of providing quality water filtration systems in Cyprus and with an impressive portfolio of clients from the residential and commercial sectors – local companies, including hospitals, schools, hotels and government departments). Quality control (they stock a wide range of filters from the UK, Europe and USA – for both under and over the counter and at point of entry in to your house: taps; ultra, UV and reverse-osmosis water systems; water dispensers (hot & cold) that don’t use plastic bottles; shower filters; and they are the only authorised importers of the famous Doulton Ceramic filters). Quality testing including microbiological and chemical analyses through recognized and approved laboratories, ensuring compliance with water quality regulations and laws. These little counter-top filters are great – they are discreet and low-cost, making them an ideal solution for your home. 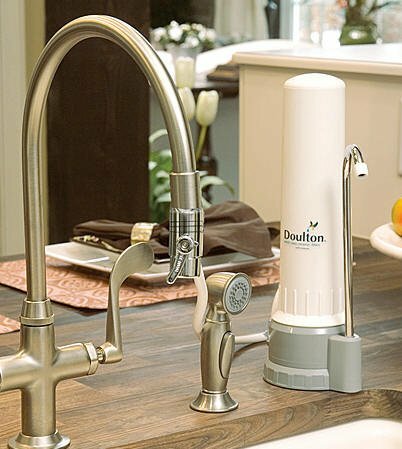 Doulton® water filters have now been manufactured continuously in the UK for more than 185 years. All Doulton® ceramic water filter products are manufactured in FICL’s factory based in North Staffordshire, UK, the traditional home of the ceramic industry in England. The HCP & HCS counter top filters are extremely easy to install and uninstall, making them portable and, therefore, the ideal solution for people who move house every now and then – like many of us Mums in Cyprus members! Their Supercarb® ceramic is fitted with an activated carbon block. Among other things, we were told that activated carbon is very effective at removing chlorine, parasites and contaminants from water. Who knew?! The Doulton® ceramic filter candles have an anti-bacterial matrix integrated, which inhibits bacterial growth on the filter. Unique to Doulton® filter elements, a micro-biological sealing mechanism gives unrivalled protection. We left the Karma WaterShop feeling rather educated and ‘in the know’, and more than happy to recommend their great water filtration systems. You can find these Doulton® ceramic filters in all of the Karma WaterShop stores (branches) across Cyprus. Stay tuned for a #WednesdayWin competition, coming soon, to win one of these Doulton® ceramic filters for yourselves! 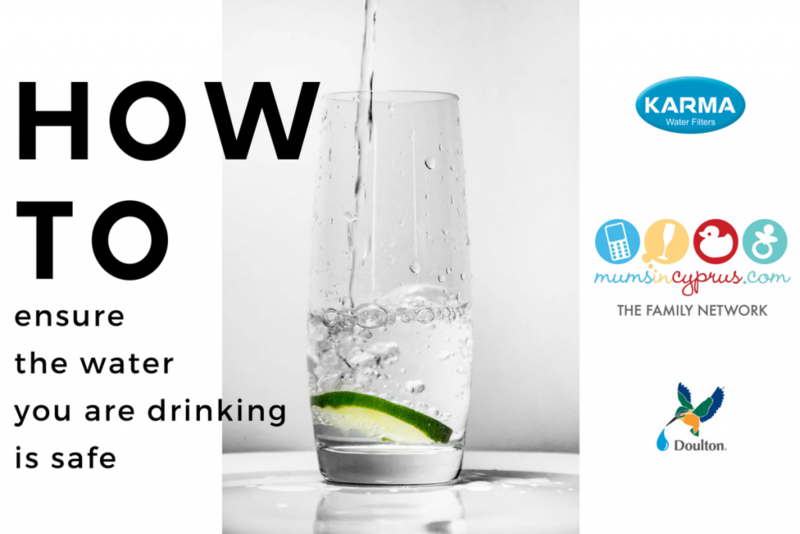 You can find out more about Karma Water on their website (readable in Greek, English and Russian); their Facebook and Twitter pages.